My edited collection, Disability in Science Fiction: Representations of Technology as Cure, will be published by Palgrave Macmillan August 8, 2013. It is available for pre-order from most major North American and European booksellers! 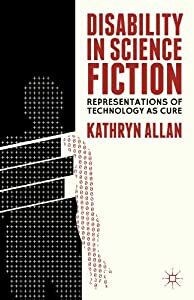 Book description: In science fiction, technology often modifies, supports, and attempts to "make normal" the disabled body. In this groundbreaking collection, twelve international scholars – with backgrounds in disability studies, English and world literature, classics, and history – discuss the representation of dis/ability, medical "cures," technology, and the body in science fiction. Bringing together the fields of disability studies and science fiction, this book explores the ways dis/abled bodies use prosthetics to challenge common ideas about ability and human being, as well as proposes new understandings of what "technology as cure" means for people with disabilities in a (post)human future. Additional note: I edited this collection for both scholars and serious fans of SF. The analysis is academic, but the language accessible (i.e., we avoid esoteric terms & explain any complex theoretical ideas). 10. Disabled Hero, Sick Society: Sophocles’ Philoctetes and Robert Silverberg’s The Man in the Maze, Robert W. Cape, Jr.